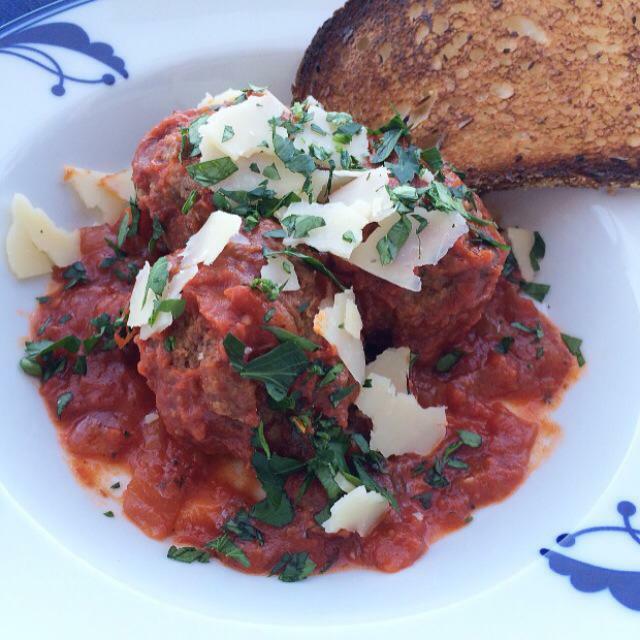 Prato, is a wonderful restaurant in Winter Park, Florida and they serve these iconic meatballs that are out of this world fantastic. I’ve never asked what they put in them, but there has to be a variety of different meats and a ton of parmesan cheese. Looking for that perfect stick-to-your-ribs meal on a cold winter night? Look no further. For a winter dinner, I serve this with a green salad and lots of crusty bread to soak up the sauce. OMG, is this an easy meal, and delicious! 1. To make the sauce, heat the olive oil in a large pot. Add the onion and sauté over medium heat until translucent, about five minutes. Add the garlic and cook about a minute more. Add the wine and cook on high heat until almost all of the liquid evaporates. This will take no longer than five minutes. Stir in the tomatoes, parsley, salt, sugar and pepper. Simmer on the lowest setting. 2. While sauce is at a simmer make the meatballs. Place both meats, bread crumbs, parsley, parmesan, salt, pepper and egg into a bowl. Combine lightly with your hands. Using your hands form the mixture into meatballs. I made about 15, 2-inch meatballs. 3. Pour a mixture of vegetable oil and olive oil into a skillet to a depth of 1/4 inch. Heat the oil and place meatballs in oil and brown well on all sides over medium heat. This should take about ten minutes. Depending on the size of your pan you may need to work in batches. Do not over crowd the pan. Once browned, add the meatballs to the sauce and continue to simmer the sauce about 30 minutes, or until meatballs are cooked through. Top wish freshly shaved parmesan and chopped parsley. These look absolutely perfect, especially for this time of year! Thanks Matt! I think I could eat them for breakfast, lunch and dinner! Second time making these–my husband and I thought, “if we were at a restaurant eating these, we would be freaking out about how good they are”. Best part? You can actually make them! Leftovers are perfect on a fresh french baguette. Thanks Molls!